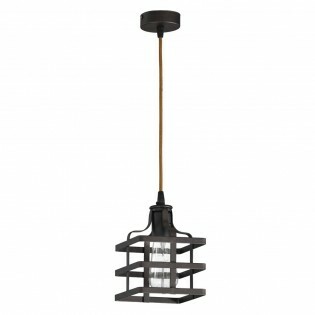 Ceiling lamp Canel with metal design, dark brown finish and cage-shaped design to light up rustic style rooms such as dining room, living room, bedroom etc. Dimensions: Heigth 60 cm. Diameter 14 cm. 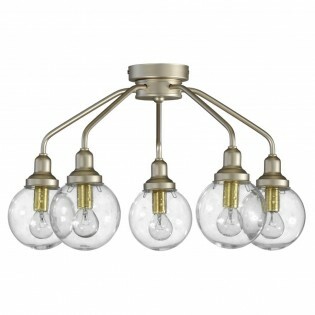 Ceiling lamp with adjustable height consisting of five lighting points, glass spherical lampshades and metal main construction. Ideal to light up modern style ambiences in living rooms, dining rooms, etc.br />Dimensions: Heigth 40-70 cm. Diameter 55 cm. Ceiling lamp with eight lights of the collection Dinko, adjustable height and glass lampshades to light up modern style environments in rooms such as dining room, living room or bedroom.Dimensions: Heigth 40- 70 cm. Diameter 65 cm. 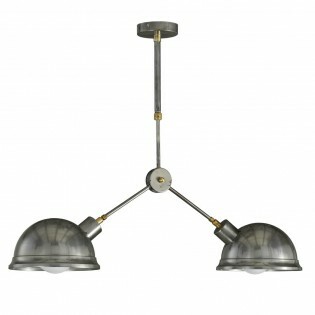 Pendant lamp Emus of modern style with two lighting points and adjustable heigth. A design made up of two oval-shaped lampshades and a main structure with a black finish. Ideal for decorating and lighting your dining room table, living room, bedroom etc.Dimensions: Heigth 50 - 66 cm. Length 78 cm. Width 22 cm. 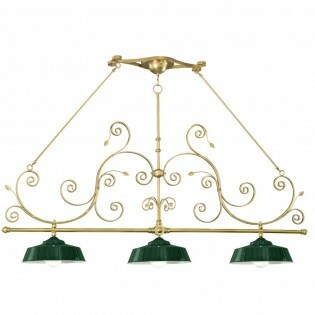 Ceiling lamp of the Flayer collection with three lighting points (bulbs NOT included), structure designed with gold undulations and green lampshades. It is a classic style design that will fit perfectly in your dining room or living room.Dimensions: Heigth 125 cm. Heigth with chain 175 cm. Length 190 cm. 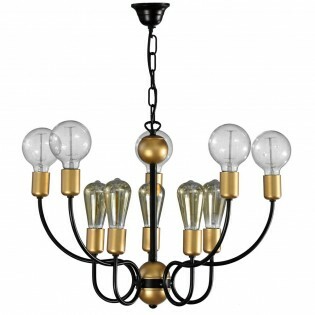 Ceiling lamp of the Kelan collection with ten lights, metal chandelier design and gold and black finish. It is perfect for rooms decorated with retro-vintage style.Dimensions: Heigth 44 cm. Diameter 68 cm. 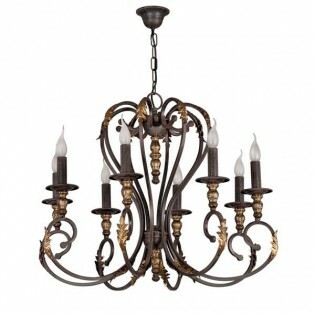 Chandelier of classic style and rustic air, metal ornaments and long-stemmed candleholders. Handmade in different shades, rust brown and gold details. Very suitable for lighting living rooms, dining rooms, both in homes and in hotels and restaurants decorated in classic style and with a rustic touch. Dimensions: Heigth 60 cm. Diameter 58 cm. Ceiling lamp Yami consisting of five lights with seat post for height adjustment. 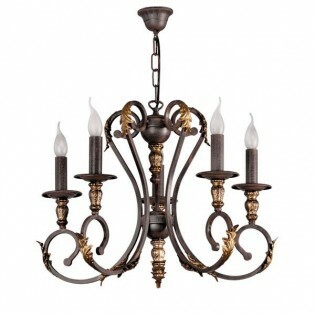 Designed in the shape of a chandelier, with slightly wavy arms in dark brown. 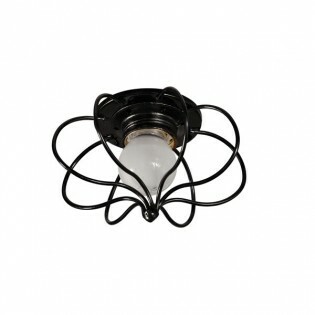 Ideal for placing vintage style bulbs (NOT included). It will look great in dining rooms, living rooms or bedrooms.Dimensions: Heigth 40 - 65 cm. Diameter 43 cm. Pendant lamp Zorita with adjustable height, chandelier design, chrome plated metal structure and spherical glass lampshades. It has a decorative piece in the shape of a sphere in the structure. 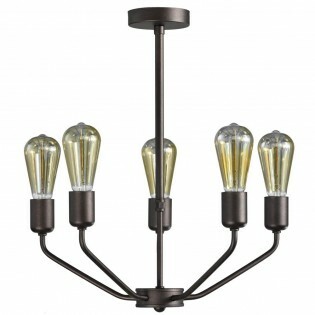 Perfect for lighting your living room, dining room, etc. with a modern touch. Dimensions: Height 40 - 70 cm. Diameter 65 cm. 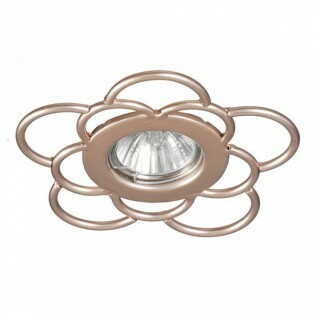 Design recessed downlight for ceilings in wave or floral form. 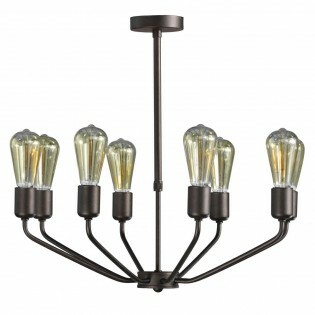 Manufactured in hand-worked metal with a golden-brown finish. 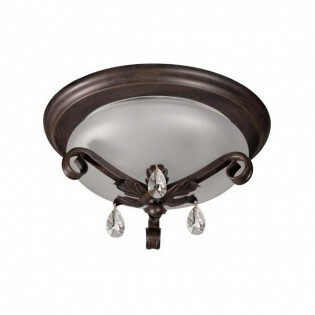 Perfect for hallways, bedrooms, living rooms and environments decorated in classic or rustic style. Dimensions: Heigth 0.5 cm. Diameter 15 cm. Spotlight with flower design and 2 levels of leaves. Manufactured in hand-worked metal with gold finish. Perfect for corridors, bedrooms, living rooms and environments decorated in classic style. Dimensions: Heigth 7,5 cm. Diameter 22 cm. 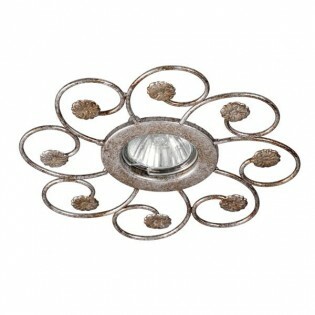 strong>Ceiling spotlight with flower-shaped design with 2 levels of leaves and glass beads at each end. 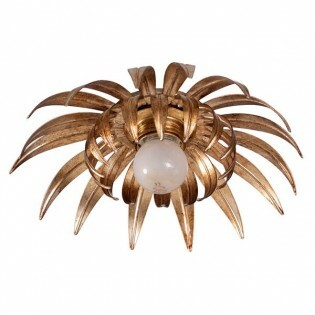 Made of handmade metal with an ivory or gold finish. Perfect for corridors, bedrooms, living rooms and environments decorated in classic style. Dimensions: Heigth 7.5cm. Diameter 23cm. 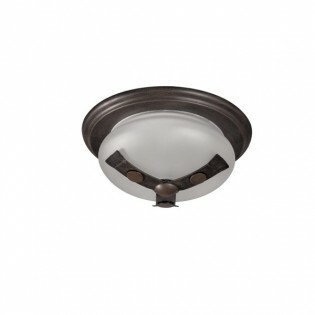 Classic style recessed downlight with contour flower design. Manufactured in handmade metal with a tobacco-gold finish. Perfect for hallways, bedrooms, living rooms and environments decorated in classic style. Dimensions: Heigth 0,5 cm. Diameter 16 cm. 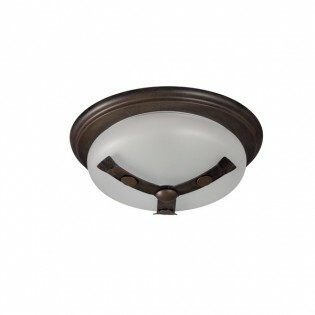 Recessed downlight with grille design. Manufactured in handmade metal with a platinum finish. Perfect for corridors, bedrooms, living rooms and environments decorated in classic style. Dimensions: Heigth 0,5 cm. Width 14 cm. Depth 14 cm. 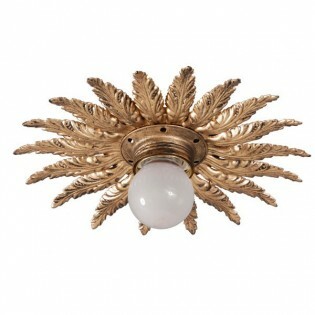 Spotlightfor ceilings with decoration of leaves of small ferns stretched around. 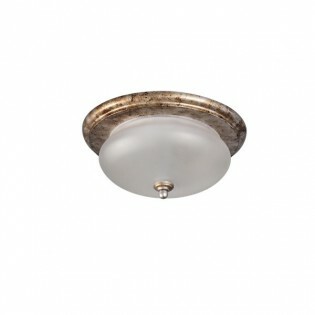 Manufactured in handmade metal with an antique gold finish. Perfect for corridors, bedrooms, living rooms and environments decorated in classic style. Dimensions: Heigth 7,5 cm. Diameter 20 cm. 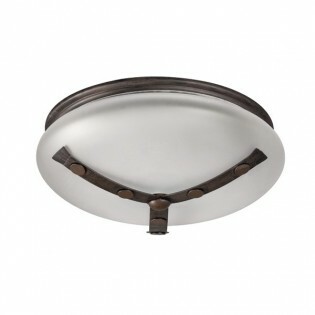 Recessed downlight with plant inspiration for design ceilings. Manufactured in handmade metal with silver finish. Perfect for corridors, bedrooms, living rooms and environments decorated in classic style. Dimensions: Heigth 0,5 cm. Diameter 19 cm. 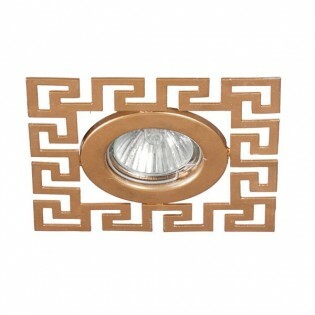 Recessed Spotlight of Egyptian inspiration square-shaped design. Manufactured in hand-worked metal with gold finish. Perfect for corridors, bedrooms, living rooms and environments decorated in classic style. Dimensions: Heigth 0,5 cm. Width 13 cm. Depth 13 cm. 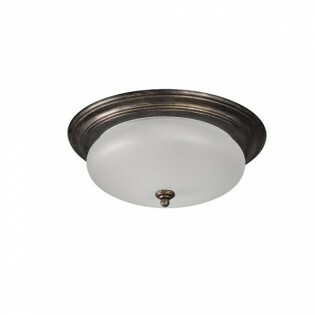 Ceiling spotlight simple design with metal wrap-around flush light around the bulb. 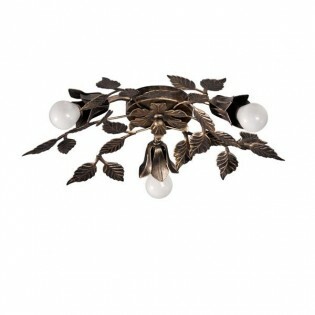 Manufactured in handmade metal with a pearl black finish. Perfect for hallways, bedrooms, living rooms and ambiences decorated in classic style. Dimensions: Heigth 10 cm. Diameter 16 cm. 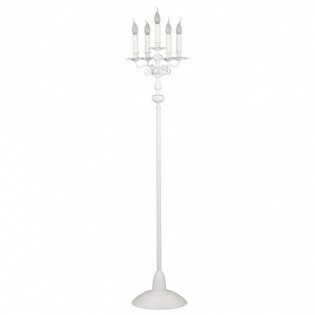 Floor lamp with chandelier-shaped lamp holder, base with decorative ornaments, made of handmade metal. 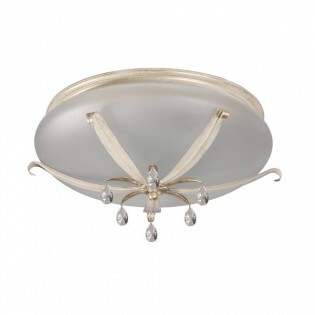 For living rooms and bedrooms where you are looking for an auxiliary light in a classic style. Dimensions: Heigth 177 cm. Diameter 56 cm. Classic Floor Lamp with ornamented arms decorated with decorative details of plant motifs. Made of handmade metal with a candlestick effect and a petalled container. Very suitable as an auxiliary light point in living rooms, passage areas, homes, restaurants and charming hotels decorated in classic style. Dimensions: Heigth 166 cm. Diameter 33 cm. 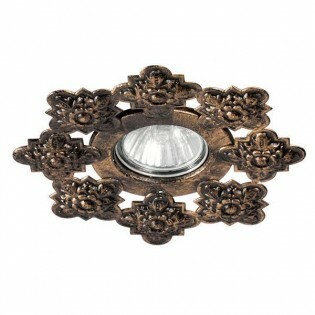 Flush light bush-shaped with metal leaves and flowers, handcrafted with tobacco gold finish. 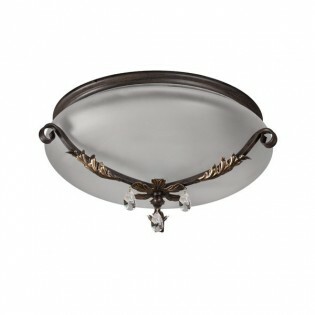 For installation in corridors, halls, living rooms or bedrooms with classic decoration. Dimensions: Heigth 10 cm. Diameter 40 cm. Ceiling light with metal base finished in rust-brown and opal effect spun glass lampshade, metallic decoration with almond shaped hanging crystals. Perfect for installation in corridors, dining rooms and classic style living rooms. Dimensions: Heigth 13 cm. Diameter 26 cm. Ceiling light with metal base finished in rust-brown with gold details and opal effect spun glass lampshade, metallic decoration with almond-shaped hanging crystals. Perfect for installation in corridors, dining rooms and classic style living rooms. Dimensions: Heigth 15 cm. Diameter 32 cm. 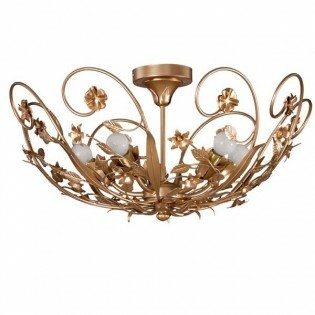 Flush light decorated with leaves and flowers of the same metal, hand-made, finished in reddish gold. Suitable for corridors, living rooms and bedrooms in classic style. Dimensions: Heigth 30 cm. Diameter 50 cm. Flush light with an important metallic base finished in rust-brown and an opal effect centrifuged glass lampshade, metallic decoration with metallic "buttons". Perfect for installation in corridors, dining rooms and classic style living rooms. Dimensions: Heigth 13 cm. Diameter 26 cm. Flush light with metal base finished in rust brown and opal effect spun glass lampshade, metal decoration with metal "buttons". Perfect for installation in corridors, dining rooms and classic style living rooms. Dimensions: Heigth 15 cm. Diameter 31 cm. Flush light with narrow metal base finished in rust-brown and opal effect centrifuged glass lampshade, metal decoration with metal "buttons". 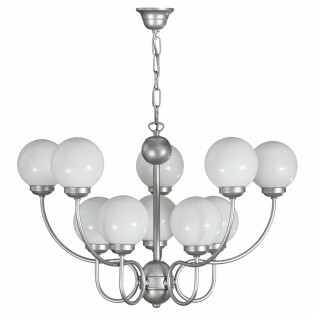 Perfect for installation in corridors, dining rooms and classic style living rooms. Dimensions: Heigth 16 cm. Diameter 40 cm. Flush light with ivory and gold-coloured metallic base, centrifuged glass lampshade with opal effect, metallic decoration with almond-shaped pendant crystals. Perfect for installation in corridors, dining rooms and classic style living rooms. Dimensions: Heigth 18 cm. Diameter 42 cm. Flush light with metallic base finished in patinated gold, with a flattened opal effect centrifuged glass lampshade. Perfect for installation in corridors, dining rooms and classic style living rooms. Dimensions: Heigth 13 cm. Diameter 26 cm. Flush light with a metallic base finished in tobacco gold, with a centrifuged glass lampshade with a flattened opal effect. Perfect for installation in corridors, dining rooms and classic style living rooms. Dimensions: Heigth 15 cm. Diameter 32 cm. 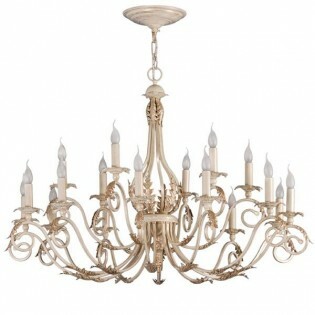 Elegant Chandelier and lights at different heights or levels. Made of hand wrought iron. 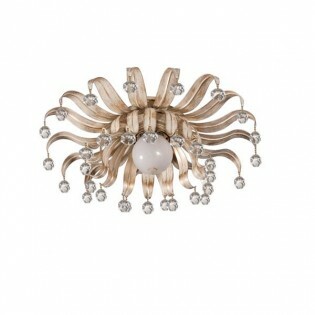 Structure decorated with metallic elements of vegetal inspiration in ivory finish with golden details. Dimensions: Heigth 37 cm. Width 40 cm. Depth 17 cm. Ceiling lamp of multiple arms with final candlestick and curved shapes. 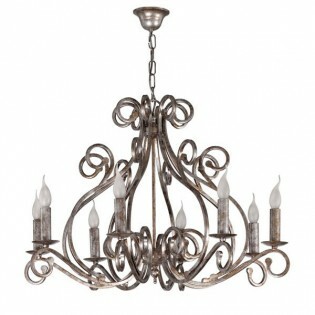 Made of hand-wrought iron with silver finish. Very suitable for living rooms, dining rooms and rooms decorated in classic or rustic style. Dimensions: Heigth 58 cm. Diameter 60 cm. 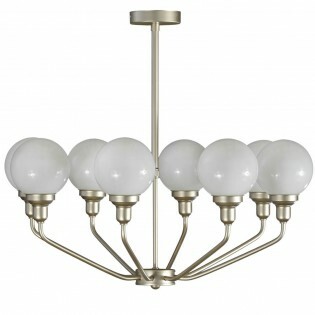 Ceiling Lamp of multiple arms with candelabrum shape and curved forms. 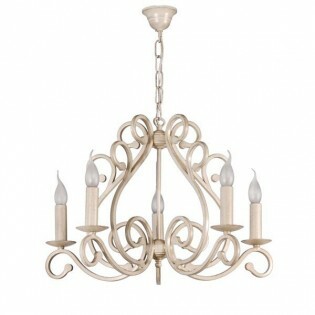 Made of hand-wrought iron with white finish. Very suitable for living rooms, dining rooms and rooms decorated in classic or rustic chic style. Dimensions: Heigth 58 cm. Diameter 60 cm. Arm lamp with fabric lampshades and spherical shapes at the base of each arm and handmade metal knot, gold finish. 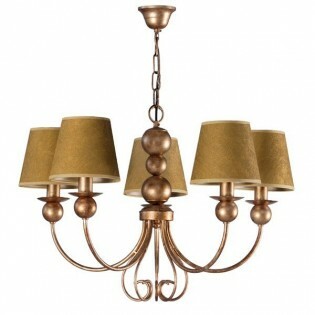 With fabric lampshades in gold color. 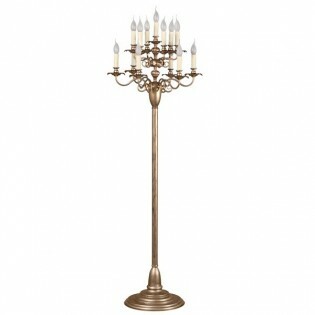 Perfect for installation in rooms decorated in classic style, such as living rooms or bedrooms. Dimensions: Heigth 60 cm. Diameter 63 cm.